Habit: Deciduous forests, conifer forests, rainforests, grasslands, farm land, marshes, and even deserts. Life span is approximately 9 to 12 years. It is a long-legged, fast-moving mammal. Anatomy: White-Tailed Deer are about 3 to 3 1/2 feet tall at shoulder. Bucks (males) weight up to 400 pounds (180 kg), does (females) weigh up to 200 pounds Fawns (babies) are usually born in May or June. Only bucks have antlers, which are branched; the antlers are shed each year, and later regrow. Problems: Love to eat organic gardens! Humans and deer often share a habitat, there can be problems for both of them. 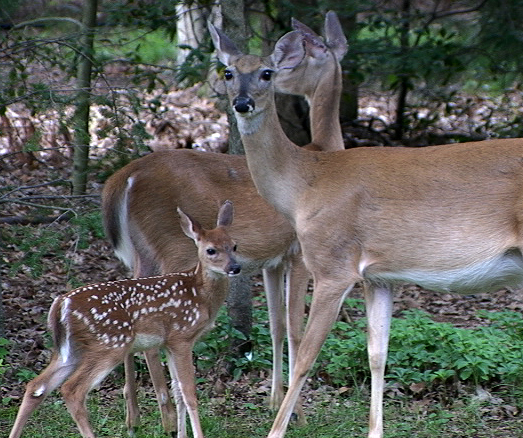 When a deer's habitat becomes smaller because of human development, deer will often eat food from gardens. Deer need to cross roads to look for food and water and are sometimes struck by cars. People can also catch a sickness called Lyme Disease from the deer tick. Q: My garden is on the edge of wooded tract of land and plenty of deer around to nibble on crops. I run two electric fence wires (no fence charger used ) around the garden, one about 12" above the ground and the other about 36" above the ground and I hung aluminum pie plates from the top wire with nylon cord where the plate would just tap the bottom wire and would space them 30-40 feet apart or whatever looks good. If there were any wind, the plates would bang on the bottom wire and send vibrations along the wire. At night if there is any light source, i.e. moon light, night light, head lights etc. the plate would reflect that light as it moved and make an intimidating flash that made the deer nervous and they would move on. A: Still having trouble with deer I have heard of people laying fencing about 60" tall with a 4" square mesh on the ground and staked it up off the ground about 6" in random spots where the deer would have to walk across the uneven wire and that irritates them when there feet hits the wires and the fence would rattle. Of course with either method deer could still get to the crops but it is a great deterrent. – America's Finest Deer and Rabbit Repellent – is all natural, biodegradable, environmentally safe and guaranteed to keep deer and rabbits away from your prized gardens, shrubs and trees, while not being offensive to humans. Deer Scram won’t harm animals, the environment and, most importantly, you and your family. Blended from selected organic components, Deer Scram will keep deer off your plantings because it convinces deer that harm is nearby through their uncanny sense of smell. Deer Scram will change deer behavior. As they near the applied barrier of Deer Scram, deer actually alert to a sense of danger – even death! Remember that Deer Scram effectively protects your favorite plants from rabbit damage as well as deer. Rabbits dislike Deer Scram as much as deer. Get rid of rabbits that eat your flowers and vegetables. Apply Deer Scram any time of year! 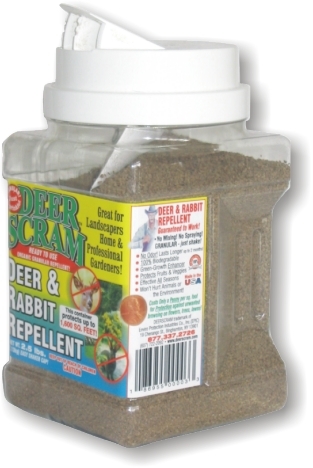 Apply Deer Scram now to stop deer browsing, change the paths the deer have grown accustomed to using through your yard and guard your gardens, trees and shrubs! Deer Scram can be applied as a protective perimeter strip or it can be evenly spread over a garden bed or flowerbed. Deer Scram will shield your flowers, shrubs, trees, ornamentals, vegetable gardens, forests, vineyards, orchards, field crops and nursery stock when used as directed and consistently applied every 30-45 days. Deer Scram will keep deer away for good but will not harm the deer. 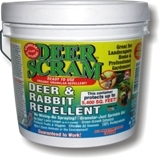 Use Deer Scram to keep deer out of any botanical areas. Get plant protection now! To keep deer out of your garden, build a strong electric or very tall fence or try the following. These techniques sometimes work. Spray the perimeter of the garden with raw eggs and water. Place small porous bags of human hair around the garden. One of my listeners recommended this. Put in a simple two wire electric fence. On the top wire strung about 4’ off the ground hang 2 x 6 inch strips of aluminum foil. Put a little peanut butter on the strips. The first contact pretty much solves the problem.